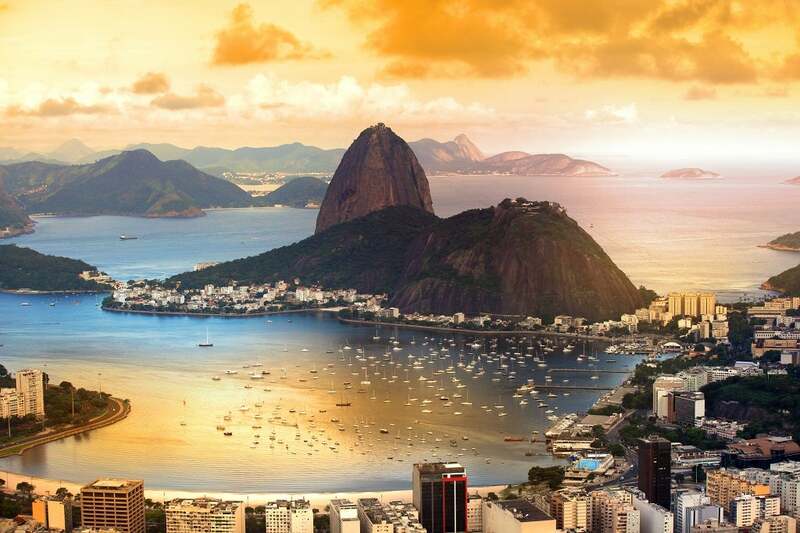 Brazil’s vibrant cities, heavenly beaches, exotic jungles, and great weather make it one of the most popular destinations for expats from all over. As the largest country in South America, moving to Brazil presents its new residents with a myriad of new experiences. With its resource-rich economy, Brazil has also a lot of job opportunities. Can you imagine, after a regular day at the office, you spend the afternoon having a drink by the sea or playing beach volleyball with your friends? That’s how life is in some Brazilian cities. But Brazil is not only beach and samba. São Paulo is a modern cosmopolitan city that is also a melting pot of ethnicity and culture. Brasilia, the capital, is a UNESCO World Heritage Site, and has a big expat community. If you are looking for a less urban life take a look at Curitiba or Florianopolis. If you prefer a milder climate, you could move to Porto Alegre or Campos do Jordão. Let’s be clear. Getting a tourist visa (valid for 90 days) it’s easy, but getting a work visa in Brazil it’s not a simple process. You should prepare yourself for a long wait and much paperwork. There are two types of visa which enable foreigners to start working in Brazil. The first one is valid for working in a specific position for a limited period of time, which means you cannot change jobs throughout your stay in the country. If you want to move to Brazil, but you still haven’t found a job, you should try to apply for a permanent visa. It is more difficult, but it allows you to change jobs during your stay. Basically, in order to get it, you will need to convince the Brazilian authorities that you have highly specialised skills which would benefit the Brazilian economy. Expats who can speak Portuguese and who are willing to invest at least BRL 150,000 in Brazil are able to get a permanent visa valid for five years. After this period, the visa can be renewed if the applicant has created employment for at least 10 Brazilian citizens. Healthcare in Brazil is free for all residents. However, the system is often under-financed and this can impact the quality of the service. Due to these difficulties, the use of the private sector has grown tremendously. Today, around 25% of the Brazilian population have private medical insurance. Private healthcare in Brazil has earned the reputation of being the most expensive in Latin America. If your company doesn’t provide you with private healthcare (they often do), you can expect to pay around BRL 8,000 a year for this service. Brazil is internationally known for its high quality doctors and healthcare (particularly in the field of surgery and dental care). After decades of growth, Brazil’s economy appears to be slowing down. However, the country has still one of the biggest emerging economies of the world. Finance, IT and engineering sectors are always looking for qualified workers, although your best chance to end up working in Brazil is to join an international company with a posting in the country. Brazil has well-developed agricultural, mining and manufacturing sectors. It’s the world’s largest producer of sugarcane and coffee, and it’s also a big exporter of cocoa, soya beans, orange juice and tobacco. The renewable energy sector is one of the country’s big bets for this decade. The automotive industry is also growing. In Brazil the maximum working hours per week is 44, not exceeding eight hours per day. You will typically work from 8am to 6pm with 30 days of holiday. Official language: Portuguese however, it is slightly different from the Portuguese spoken in Portugal. So if you are coming to Brazil and you want to learn the language before you arrive, you should pay attention to learning the “right” Portuguese beforehand. Tipping: At almost all restaurants and bars, a standard service fee of 10% is included at the end of the bill. This fee is not compulsory, even though it may seem so. Most people do pay it unless the service was bad. Unusual fact: Rio de Janeiro was once the capital of Portugal, making it the only European capital outside Europe. Renting an apartment in the centre of a Brazilian big city, can be pretty expensive. A 3 bed, 2 bathroom apartment in the centre of Rio de Janeiro can cost you almost BRL 5,000. There are a lot of things you should take into account before renting an apartment in Brazil. The first one is that due to heavy traffic congestion, you should consider living close to your job and your children’s school. Many apartments and houses in Brazil are rented unfurnished (they may even exclude kitchen appliances and light fittings). In order to rent an apartment you will need to have a proof of your income. If you are not working at the moment, then you will need a couple of guarantors. The process is very bureaucratic and it can take a couple of weeks, so when moving to Brazil be prepared to live the first months in a hotel. Many expats are surprised to learn that the cost of living in Brazil is relatively high. It always depends on where you want to live. Prices in Curitiba, for example, are 20% cheaper than in São Paulo. And if you live in Florianopolis or Fortaleza you will spend 15% less money that if you lived in Rio. The prices below are based on Rio de Janeiro cost of living. At the supermarket you can expect to pay BRL 4 for a litre of milk and BRL 6 for a dozen of eggs or 1kg of tomatoes. Buying a table wine at the supermarket will cost you BRL 40 and a beer almost BRL 4. On the big cities a lot of people prefer eating out during lunchtime. A lunch menu in a business district will cost you around BRL 30. Despite bad traffic conditions, having your own car is your best bet for getting around during your time in Brazil. With more than 1.7 million kilometres of roadways, Brazil has the largest road network in all Latin America and the fourth largest in the world. The country is currently building even more roads. Due to high taxes, buying a car in Brazil is not cheap. A basic new one will cost you around BRL 70.000. But it’s worth it. The car is the most convenient and flexible option to travel inside Brazil, as are airplanes for longer distances. Schooling is free and mandatory for children between the ages of six and 14. But, despite Brazil’s economic development, the country’s public education system has still a lot of social and structural problems. Most expats prefer to send their children to private schools. Regardless of the system, be it public or private, Brazilians students should have 200 days of school per year. The academic year starts in February and goes until July when there is a holiday month. The second term starts at the beginning of August and it goes until December. After secondary education, students may continue their studies at a public or private university. To enter a public university, students must sit an entrance exam, known as vestibular. Entrance exams to a private university are easier and, as a consequence, public university degrees are better valued than those from private institutions. Foreigners are allowed to drive in the country with a driver’s license issued abroad for up to six months. After that, it is mandatory to apply for a local license. The exam must be taken in Portuguese and involves a medical and psychological examination. The speed limits in Brazil are 110 km/h on most national roads, 80 km/h on open roads, and 60 km/h in built-up areas. There are toll roads in all the big cities. You should also be careful about drinking since in Brazil there is a Dry Law (Lei Seca), which means the legal blood-alcohol limit is very low, at 20mg of alcohol per 100ml of blood (0.02%). If caught, the fines are very high, your license will be suspended and you can even go to jail. Finding the right place to live in Brazil depends on many factors. If you are looking for a job opportunity than you should definitely move to São Paulo. It’s the most important city for business and finance, and it’s home to the bigger expat community of the country. If you prefer a more relaxed lifestyle, you can consider moving to Rio. It does not have that many job opportunities as São Paulo, but you can always work as an English teacher or in the petrochemical sector, which is centred on Macaé, 100km from Rio. If you are looking for a more relaxed life you can either go north or south. On the south, Curitiba or Porto Alegre are two popular cities among expats. They have lower prices a milder weather. If you prefer a more laid-back way of life, you should go north. Recife and Salvador are two big expat communities and Natal (in Rio Grande do Norte) is rated as the most liveable city in the country. Brazil is the 5th biggest country in the world so here you will certainly find exactly what you are looking for. If you want to travel it’s better to do it by car or airplane. Brazil has the second highest number of airports of the world, after the USA. It’s also a perfect destination for expats since communities of almost every nationality already exists, for example, the biggest Japanese community outside Japan is in Brazil (São Paulo). Brazil is a flexible, friendly, and tolerant country, with a prominent LGBT community in Rio de Janeiro. If we talk about religion, here is another curious fact. Brazil is one of the countries in the world with more Catholics than other religions; 64% of its population are catholic in Brazil.